As availability shrinks here, a local humanitarian wonders how he's going to continue sending meals to malnourished children in Africa and the Dominican Republic. Dave Spoon soon must make 285,000 rice meals to ship to the world's hungriest children, but he has no rice. Spoon's predicament is an unanticipated and heartrending twist to this week's big story of diminishing rice availability. The Washington state feeding director of the Silverdale-based Children of the Nations, which serves hungry and destitute children in Africa and the Dominican Republic, is scheduled to host a May 16 event in Silverdale to assemble the rice-based meals. Volunteers are to add the rice to beans, dehydrated vegetables and chicken powder to make the food packets. Then, Spoon's group will ship them to malnourished children. His group provided half a million such meals last year. But no rice, no packets. To illustrate the scope of the problem, Spoon's gaping need translates to 400 50-pound bags of rice. Big bags of rice are getting harder to come by here and elsewhere as Costco Wholesale Corp. and Sam's Club, a division of Wal-Mart Stores Inc., limit the amount of bulk rice they sell. Costco's five-bags-per-customer limit went into effect in the Northwest on Thursday, Doug Schutt, chief operations officer for Costco, told the Kitsap Sun. The Costco limit is generally on 25- and 50-pound bags of long- and short-grain white, basmati and jasmine rices, depending on what's normally sold at individual stores, Schutt said. No end to the limit has been scheduled, but the company will sell more to customers who have purchased more in the past, he said. "We are just trying to prevent unfair hoarding and unfair buying by many individuals. We're actively pursuing as much rice as we can get, but, needless to say, there's a severe shortage out there," Schutt said. Spoon knows. "I'm just saying this is how quickly things change. A week ago, I went to Costco and bought 50 50-pound bags, and now I've heard rationing," Spoon said. He used that rice for a Yakima food-packet event. His regular supplier in California, himself facing a rice shortage, refused to sell to Spoon this week, reserving what he had for his bigger buyers. "They're in big trouble, and thus I'm in big trouble. And you know what, these children are in trouble," Spoon said. Meanwhile, he's soliciting local service groups for rice contributions. This week, he implored members of the Rotary Club of Silverdale to buy individual bags of rice and send them his way. Sam's Club was the other big retailer to institute limits on 20-pound bags of rice to four per member. Like Costco, the limit didn't apply to smaller bags. There are no local Sam's Clubs. Calls placed to big-box retailers and grocery stores throughout Kitsap and North Mason counties Friday suggested customers had stocked up on the big bags of rice. Supplies of some of the smaller bags of rice were normal at some groceries but running low at others. "I'll get it any way I can get it, at this point," Spoon said. Dave Spoon of the Silverdale-based Children of the Nations seeks donations of white rice in the largest available bags. They will be made into food packets for malnourished children abroad at a May 16 community event at Silverdale United Methodist Church. Rice contributions can be dropped off at Children of the Nations headquarters at 11992 Clear Creek Road weekdays between 9 a.m. and 5 p.m. For more information, call the group office at (360) 698-7227 or visit its Web site, http://www.cotni.org/. 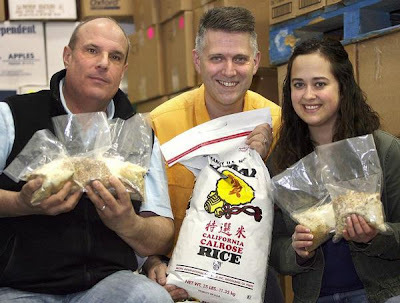 Dave Spoon, Dave Schertzer and Sam McCabe, serving with Children of the Nations and Ready Relief, pictured with a few bags of rice already donated towards the upcoming 285K event May 16th.